The Industrial Truck Association has placed forklift trucks into seven classes. 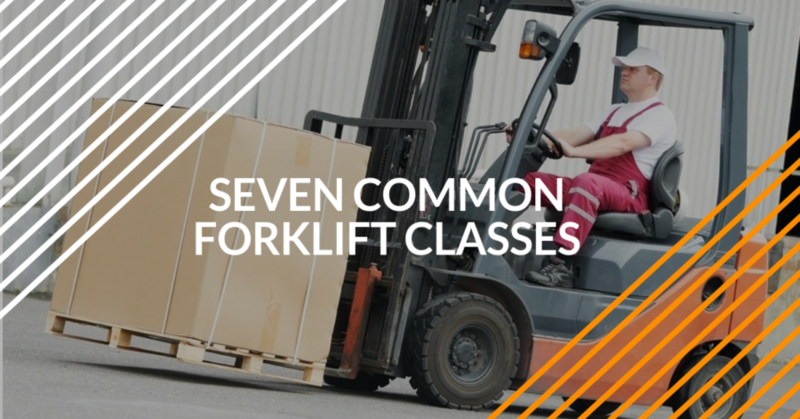 Whether you are responsible for purchasing powered industrial trucks for your company or are a forklift operator preparing your resume, you need to know the seven classes of forklifts that are in common use. Forklift classes are based on criteria such as the type of motor, the type of tires used and whether the operator rides on the truck itself or operates it by hand. Rough terrain trucks are in a class by themselves. ForkliftCertification.com knows all about forklift class types, training requirements for each kind of equipment, and how to help your company become OSHA compliant. All employers are responsible for training their employees on all forklift class types. Thanks to our training modules, you’ll know exactly what to expect for training and compliance, regardless of the forklift classes you use. Sign up today and get compliant – discover the difference at ForkliftCertification.com. Classes I, II and III classes of forklifts with electric motors are further divided into five or more subcategories. Class I, IV, and V forklifts (1, 4, 5) are considered Warehouse Forklifts, and include sit down riders and stand up riders-electric, sit down rider forks-gas or LPG, counterbalanced, sit down rider fork-gas or LPG, counterbalanced. Class II and III forklifts (2, 3) fall under the category of Pallet Jacks and Order Pickers. These include high-lift straddles, reach type outriggers, side loaders, turret trucks, swing masts and convertible turrets/stock pickers, low lift pallet and platform, low lift platform, low lift walkie pallet, reach type outrigger, high lift straddle, high lift, counterbalanced, low lift walkie/ricer pallet. Class VII (7) forklifts are rough terrain forklifts, and include sit down rider Class 7 lifts, straight mast forklifts, extended reach trucks, telescopic lifts, extended boom lifts, and straight mast rough terrain forklifts. Of all the forklift class types, this one is definitely the most durable and rugged! Electric motor, rider, and counter balanced trucks with solid and pneumatic tires are all powered by an electric motor. Depending on the model, the driver may either sit in or stand on the forklift. The counter balanced class 1 forklifts are heavy in the rear to counterbalance the weight of the front loads. The other class 1 sub-groups are identified by having either three or four tires, and cushion or pneumatic tires. Cushion tires are used indoors on smooth floors. Pneumatic tires are used outdoors and can handle rugged ground. When work takes place indoors, class 1 electric forklifts do not emit toxic fumes, are less noisy, and are designed for warehouses. Given all the forklift class types, Class 1 include some of the most commonly used powered industrial trucks. Many people are confused about different forklift class types, including Class 2 & 3 forklifts. Classes of forklifts 2 and 3 also consist of electric trucks but are made specifically for maneuvering narrow aisles. They are more compact in design and can operate easily in tight spaces. Class 2 and 3 forklifts do not emit toxic fumes, and are designed for work that does not need or can’t accommodate the size of a larger forklift. Class 4, 5, and 6 forklifts are very similar forklift class types – within the same class! Class 4 internal combustion engine trucks use solid tires for indoor use on a smooth floor. Class 5 internal combustion engine trucks are fitted with pneumatic tires, which are used outside on uneven terrain. Both 4 and 5 forklift classes are powered by gas, diesel, or LP gas. Class 6 forklifts are electric and internal combustion engine trucks that can be used in a variety of environments. This class describes rough terrain forklift trucks, which all use pneumatic tires for operating outdoors. They are mostly used on construction sites or in lumber yards and can handle the uneven landscape of these worksites. You don’t use a sledgehammer to crack a nut and you don’t need a rough terrain forklift to shift cartons of toilet paper in a warehouse. Once you know more about the forklift class types, you’re better prepared to know which lift “fits” for whatever job you’re doing. This is helpful for safety supervisors, managers, and forklift drivers alike! For example, Class IV forklifts are built for solid or cushion tires. Because some forklifts are built for one type of tire or the other, your class of forklift begins with your choice of tire. The operating environment. If your warehouse has narrow aisles, you might be better off with a Class II truck. Checklists – OSHA requires operators to work through a daily checklist to inspect their vehicles before starting work each day. There are different checklists for the different classes of forklifts, like electric versus internal combustion motors. No matter how much you may know about a certain type of forklift, you need the training for it to best protect your safety and comply with OSHA regulations. The forklift Training Kit from ForkliftCertification.com teaches all these classes of forklifts, including I, II, III, IV, V, and VII, to provide the most comprehensive online course about the forklift class types that can be completed from any device with an internet connection, and in only about one hour. You can train and be certified in all of these forklift classes today! With training courses from ForkliftCertification.com, we’ll teach you about forklift class types, safe driving techniques, OSHA regulations, how to avoid accidents, and much more. Register today with ForkliftCertification.com, and become compliant in no time. With our training courses and lifetime support, your company will enjoy a safer, more productive workplace. Sign up now!